Batu Caves is a an iconic and popular tourist attraction in Selangor. Site of a Hindu temple and shrine, Batu Caves attracts thousands of worshippers and tourists, especially during the annual Hindu festival, Thaipusam. A limestone outcrop located just north of Kuala Lumpur, Batu Caves has three main caves featuring temples and Hindu shrines. Monkeys frolic around the caves, and it is a popular spot for rock climbing enthusiasts. 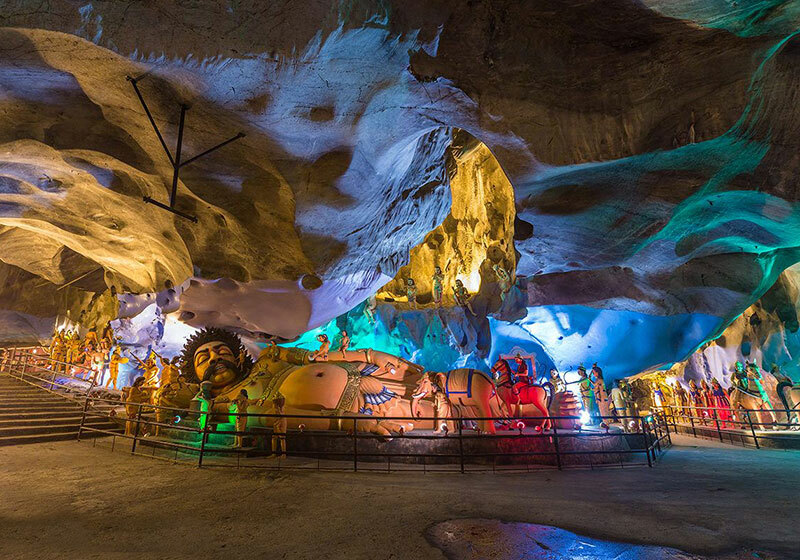 Paintings and scenes of Hindu Gods can also be seen in the Ramayana Cave. Batu Caves is a place where you should not miss on your next visit to Malaysia! Short Description: Batu Caves is a limestone hill that has a series of caves and cave temples in Gombak, Selangor, Malaysia. It takes its name from the Sungai Batu, which flows past the hill. It is the tenth limestone hill from Ampang.